Christmas Ornaments Made in USA - Civil War Anniversary Glass Ornament Ball - A Christmas Ornament Co. The Blue and the Gray unified as one. Handsomely display your pride in remembering the Civil War with this beautiful blue and gray ornament ball. Perfect accents for home or garden, you will love sharing them as a reminder of what makes this country great. The war-era craftsmanship of these hand-crafted glass ornaments make them perfect for year-round outdoor displays. 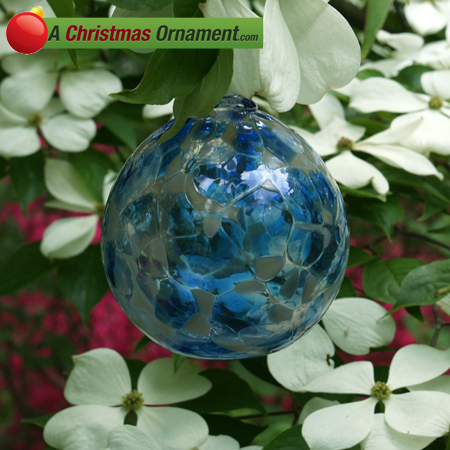 These high quality all glass decorations also make great gifts for anyone who likes the colors blue and gray! This ornament is made with pride in the U.S.A and measures 3" across. Each ornament is unique hand blown glass that will look similar to the one pictured.